In my mind's eye, it was a warm day, and the rumble of traffic competed with fans whirring in the corner of the office. The visiting French executives bemoaned the bottle of chilled white wine they would have had at lunch had it not been Prohibition. "Coty has a stranglehold on lipstick in this country. Let's try a fragrance," one of them said. "We can get Chanel's perfumer to do something for us, but nothing as upscale as No. 5. We want something friendlier, something that will appeal to the businessman's wife in Iowa, or even to Margaret." Margaret was the stenographer. She looked up when she heard her name but continued taking notes. What the heck, let's give her a bob and a lilac drop-waist cotton dress. She didn't like to say it, but she had a large bottle of Shalimar Eau de Cologne at home. "We'll call it 'Evening in Paris'. Do you think Wertheimer will go for that?" the man who suggested the name was thinking that an evening in Paris would be perfect right about then — a cool breeze off the Seine, maybe Margaret on his arm. Little did he know that Margaret called him "Old Baldie" behind his back. And so the deal was done. In 1927-28 or in 1929, depending on whether you are reading Basenotes or Richard Stamelman's book Perfume, perfumer Ernest Beaux created a sparkling floral perfume for Bourjois called Evening in Paris. It was first released in the United States, where it was instantly popular, then later marketed in France as Soir de Paris. It was packaged in cobalt blue and silver, the Wertheimer family's racing colors. To link the scent more firmly to Paris, Bourjois created an ad campaign featuring lovers by the Arc de Triomphe, replica Eiffel Towers with a spot at the bottom to hold an Evening in Paris bottle, pictures of the Paris skyline at night, and more. Evening in Paris grew so closely associated with France that American tourists brought home bottles of it from Paris — even though it originated in the United States. Vintage Evening in Paris Eau de Toilette is a bright, feminine floral smelling of violets, rose, carnation, and a pinch of powder, sort of like an expensive lipstick or a particularly nice guest soap. It dries down slightly sweet with a pinch of clove and fades quickly. It is light and easy to like, and if it is an evening in Paris, then it's an evening somewhere safe with cheerful music, easy parking, and no hard words to pronounce on the menu. The notes include violets and bergamot in the opening; heart notes of tilleul, clover, lilac, rose, and jasmine; and a base of vetiver and styrax. In 1969, Bourjois discontinued Evening in Paris. In 1991, Bourjois again commissioned the Chanel house perfumer, this time Jacques Polge with Francois Demachy, to redesign it for the modern market. Polge and Demachy created an Eau de Parfum with top notes of apricot, bergamot oil, green notes, peach, and violet; a heart of Damascene rose, heliotrope, jasmine, lily of the valley, orris, and ylang ylang; and a base of amber, cedar, musk, sandalwood, and vanilla. Bourjois rechristened it Soir de Paris and packaged it in a squat, half-moon bottle in cobalt blue with a silver label and cap. Although I smell the kinship between the vintage and the new Evening in Paris, the new version smacks of the 1990s. It opens with a shampoo-like apple scent, then morphs into a violet, rose, and apricot combo that smells to me a lot like Lancôme Trésor without the vetiver, or like Lagerfeld Sun, Moon, Stars, or a little like an Yves Saint Laurent Paris flanker. It dries down to a synthetic musky woods, and I don't get much amber or vanilla. While the vintage Evening in Paris is amber colored, the new is clear. The new version also lasts about twice as long as the vintage Eau de Toilette. The new Soir de Paris hasn't taken the world by storm the way the old Evening in Paris did. I don't know if Paris has lost its glamour or if the fustiness of the old version's image has lingered or if the fragrance just doesn't smell as appealing as other perfumes on the market. Personally I think they should have taken a page from Evening in Paris and packaged it in a miniature Eiffel Tower. 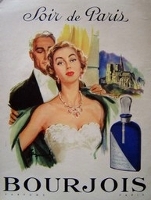 When you browse the vintage perfume sales on fleabay, Evening in Paris is practically the most frequently seen bottle in its various presentations — must've been quite a blockbuster in its day. Oh, and perfume geek question: there wasn't any Shalimar edc in the 20s, was there? But Margaret would have some Coty, I'll bet. I wonder if the Evening in Paris sold at Vermont Country Store is similar to the old one – the comments would have you believe it is true to form. Powdery violet-rose sounds a lot more like the original than the 1990s version. I wonder if there *is* another version? If so, they haven't done a lot of advertising. I had the same thought as you, it sounds like, if Beaux built it, I want to smell it. And then reworked by Polges? That was intriguing, too. In the end, though, it smelled like something from Sonja Grojsman. Shalimar came out in 1925, and I guess I was assuming it came out in extrait and EdC, but I definitely could be wrong…. I think it's the 1990s version–in the squat bottle, right? I've seen it at Marshall's too. Angela: Funny, just last week or so when it came up yet again on one of the comment threads, I said to myself: “I wonder if Angela would actually ever review Evening in Paris?” And her it is. I look forward to reading this review and the comments more closely. Ubiquitous as it is, I've never smelled the scent or seen a bottle on anyone's dresser! For a long time for me, Evening in Paris was just a name. I found a bottle at a thrift shop, though, then I went to get a sample of the new version at a perfume shop to see how it compared. “Evening in Paris”–it just sounds so intriguing. Yeah, it's that squatty cobalt blue bottle. I'll have to look around for it. Evening in Paris is definitely classier than anything in my house when I was growing up! If I had seen a bottle when I was 12, I would have swooned. This isn't meant to sound exceedingly snobbish, but exactly what kind of legit “perfume shop” was carrying the new version of which you got your sample? I thought the stuff was only sold in drugstores these days! Shows what I know. Don't worry about sounding snobbish! You don't sound that way at all, of course. I think “fleabay” is a smarty-pants name for ebay. Also, I've found lots of vintage perfumes at thrift stores, estate sales, and antique shops, so keep an eye out! My first memory *ever* of being aware of a perfume bottle dates from 1953, when I was five years old, and it was a small bottle of Soir de Paris. We were moving house and to spare me the stress of it my parents had left me with good friends of theirs for a few days. That bottle was sitting on their piano and I was fascinated by it. I know I got to sniff the perfume but I can't remember what I thought it smelled like. I learned later that in 1953 Soir de Paris was already slightly down-market. I have no memory of what my mother wore at the time. Great story, Angela! It made me laugh because it brought back some early memories for me too. When I was about 10, I got a set of EIP w/a mini bottle & dusting powder as a gift — I don't remember from whom, but I do remember my father practically rolling on the floor laughing and my mother shaking her head. It reeked! Obviously, this wasn't the original — this would have been around 1970. After that, “Evening in Paris” was family-code for a room-clearing perfume. Thanks for the article! LOL! There was also a figurine advertising Air India, I think, because the son was as travel agent. The bathroom served as a dark room – the husband was a photographer. That household was a lot more fun than ours. I stayed with those people 14 years later, when I was studying at the Sorbonne: they were much older and much less fun by then, unfortunately. I wish we could have a cup of coffee together and tell stories. I have a feeling yours would be better than mine. Evening in Paris was sold in the local Woolworths when I was a child in the 50's. I adored it, still do. It is as light and sort as Angela described, and “safe” for everyone whether it be a 5 year old girl or her grandmother. I have purchased several bottles from ebay. Even as a child, I recognized the distinct difference between the parfum and the EdT and EdC of EIP. And I loved them all. When I was alittle girl, the only Christmas Shopping I ever did was for Evening in Paris perfume. I bought it every Christmas for ” MyAggie” the woman who was more of a grandmother to me than my biological one. I was too little to have any money of my own, so my mom would create little thingsfor me to do to earn enough to buy the perfume. I remember the bottle as being so lovely and fragile. Funny, because MyAggie weighed almost 300 lbs. She was a true gem and each time I think of the perfume I can see the big grin on her warm, smiling face as she feigned surprise at the gift. I too bought it at Woolworths and thought it was just the best gift since the one the Magi offered. Memories are just the best! What a heartwarming story! Thank you so much for sharing it. I’m going to go look at my bottle right now. Thank you so much, Angela! I have been looking for a review on this charmer for years. According to the book “Guerlain Perfume Bottles Since 1928”, the watch bottle, which is a flattened circle with a pointy cap, came out in 1936 and this is the first sign of Shalimar in an EDC. While I too questioned whether Shlaimar came out in EDC way back then, I think we should give you some artistic license here because you were just trying to add to the flavour of the story. I enjoy *your* stories very much, A. The little cobalt bottle with the silver lid….I remember it well. It was the first perfume my Dad and Mom bought me for Christmas. I was 12. I wore that all the way through grades 7 & 8, before I purchased something called Aquarius, and finally by age 16 I was wearing Chanel No. 19. I carried the bottle around in my purse and dowsed myself before coming home from school, thinking it would cover the scent of my cigarette smoking. I still have a penchant for cobalt blue glass, and I still remember how much I loved that scent. If you love cobalt blue, have you seen the Nikki de St Phalle bottle?? It's gorgeous. What a story! You were a kind of junior archeologist! Have you smelled the vintage lately? It really is an easy, sweet scent. I've never tried the other versions of EIP–only the EdT. The parfum must be a real treat. And you're so right, it really does suit everyone from school girl to senior citizen. Shanghai! Well well, what a scent to smell in a Chinese market. “Charmer” is the perfect word for it. To me, the 1990s version is less charming and more dated. Maybe trying to make it contemporary was a mistake. Darn! I guess you guys caught me in an error (but I love it that you are both so into perfume that you'd know that even though Shalimar was released by then it wasn't in EdC). And you're very nice to grant me artistic license. Now *that's* sophisticated–cigarettes and Evening in Paris. (Or at least I would have thought so as a teen.) Great story, thanks! There's one in my perfume cupboard right now! I like it, too. I recently tried the newer Soir de Paris and was quite floored by it really – as in mugged by a heady barrage of sweet notes. This was as bad for me as Midnight Rain. There was too much of every sweet and accessible ingredient imaginable. It made me crave scary, civetty-bottomed chypres to be quite frank, and for those that know me that is saying something! Yikes! Knowing how you feel about civet, this is a strong statement. I thought the new Soir de Paris was sweeter upfront than the old, and more viscous where the old was lighter. In any case, as enamored as I am with the name and old-fashioned image, I won't be buying it. While readin gthrough your lovely story, I just remembered that my Mom has a bottle of this on her dresser. And I thought I'd already made my way through her perfume stash! I'm not really sure how old this version is. It's not the squat bottle…it's rather tall and oval with a slightly pointed, fluted cap that screws on. The label's silver, and it's an Eau de Toilette, but that's all I know about it. I'm trying to get up the courage to sample it…not that I'll be able to smell much with my plugged up nose. But I wonder if you have any idea if this is a reformulation or if it's the original. I'd appreciate it if you could tell me. Sounds to me like a pre-1969 bottle, i.e. the vintage version! (I'm sure the vintage version had a few formula “adjustments' in its time, too.) I'll be interested to know if it smells to you like it did to me. Interesting! I wonder where my mom managed to snag that. I did try it on last night, and I think your description is pretty much spot-on. I'm still not very good at picking out individual notes in perfumes, but I was definately getting powder and violets. I was sort of surprised at how strong the scent was when I first put it on, but it faded quite quickly. I'm not really sure I'd wear it (I usually hate powdery fragrances with a passion) but it's a relatively inoffensive perfume, and I do sort of have a weakness for violets. Every once in a while a gal gets a yearning for a little powder, roses, and violets, I think. Late to the party, Angela, but wanted to commend you on another delightful read! Thanks to your inspiration, I am wearing a little EiP right now. Powder, rose, violets — it's surprisingly chic!!! Yes, it is chic, especially worn by the right person (now you're making me think about what “chic” is–fun! ).